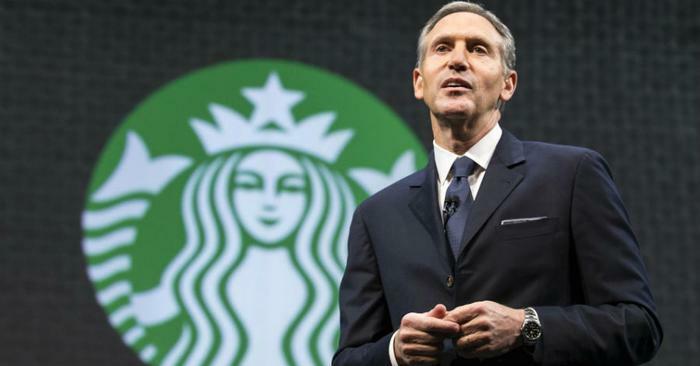 Three days after stepping down from his executive chairman position at Starbucks, Howard Schultz appears to be positioning himself for political office. He is now speaking out against Trump, the national debt, and left-leaning Democrats, as well as offering a plan to go after federal programs such as Social Security. In an interview with CNBC, Schultz targeted unnamed Democratic party lawmakers for policies he describes as too far left. "It concerns me that so many voices within the Democratic Party are going so far to the left,” Schultz said on Tuesday. “I say to myself, 'How are we going to pay for these things,' in terms of things like single payer [and] people espousing the fact that the government is going to give everyone a job. I don't think that's realistic." In the fast food industry, Starbucks was the odd-corporation-out for offering its employees medical coverage and other benefits, such as stock options and help with college tuition. Such benefits are uncommon in the fast food and retail industry, where workers have organized in recent years to demand higher wages. However, that crowd doesn’t appear to interest Schultz. Instead, he is offering plans tailor-made for fiscally conservative voters. When asked about his presidential ambitions by the New York Times, Schultz said that he could not rule out running for office. Advisors to both Jeb Bush and Hillary Clinton, politicians who also took a centrist approach, are now speaking out and warning Shultz that his conservative policies and focus on fixing the debt is unlikely to inspire voters. Polls show that most Democratic Party voters want to expand so-called “entitlements” or Social Security and Medicare, not cut them. Both Bernie Sanders and Donald Trump in the primaries had promised either to expand or not take away entitlements that Schultz says “we have to go after,” factors that analysts say bolstered both politicians’ popularity. One recent poll says that Sanders’ longtime proposal for “Medicare-For-All” health insurance now has the approval of 59 percent of Americans. Political analysts say that the concept of going after the debt and entitlements as a “center” policy is one that is only real in the heads of CEOs, not actual voters. “Schultz is laying out an appeal to the small 'fix the debt' crowd, and there's no appetite for that,” the former press secretary for Hillary Clinton told the Chicago Tribune.